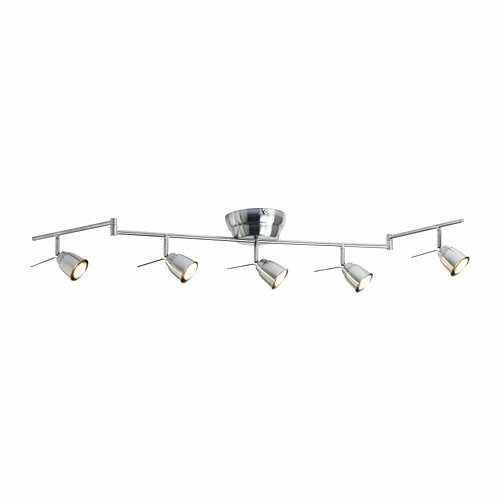 Steel, Nickel plated - Product dimensions Length: 52 " Shade diameter: 3 " Length: 131 cm Shade diameter: 6.5 cm - Light bulbs sold separately. IKEA recommends LED bulb GU10 400 lumen (5 pcs). Screws are sold separately. Choose screws which are suitable to the material you are mounting to. - Good to know Use an opal light bulb if you have an ordinary lamp shade or lamp and want an even, diffused distribution of light. Hardwired installation. Grounded. May be completed with other lamps in the same series.